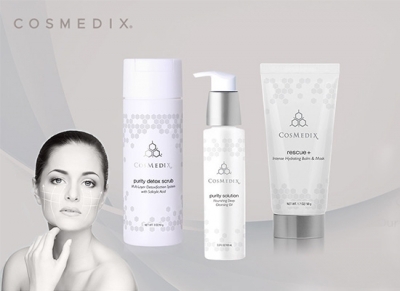 Medico beauty was founded by Constance Campion, a pioneer in Medical Aesthetic and by a renowned plastic surgeon, Dr. Aysha Awwad. Together they share the wisdom of aesthetic treatments by providing the most sophisticated skin products, and consultations to avoid & cure any kind of skin disorder. Constance and Aysha use an award-winning tactics to formulate the most sophisticated blend of botanicals that are purified using the process of chiral correction. The formulation was awarded the Nobel Prize in chemistry in 2002, Since the 1960’s, the American Federal Drug Agency (FDA) have mandated that all drugs be chiral. Medico Beauty-certified aestheticians are empowered with proper product knowledge to be the most effective skin care therapists. Their in-depth training place emphasis on targeting and treating the root cause of skin decline, and correcting unhealthy skin from within. “We partner with brands that truly change the skin from the inside out. We source chirally correct products based on Nobel Prize winning science that produce superior results. Besides providing a beauty care solution with a responsive Shopify site that is pleasing to their end customers, Medico Beauty also invests a good amount of their time in educating their end customers about healthy habits that can keep skin disorders at bay. Complexity in the logistic workflow has increased due to the concept of selling products across multiple geographies and channels. Today many companies have inclined towards outsourcing their supply chain operations in order to get rid of the hassle of storing inventory, managing transportation, planning inventory and processing order fulfillment. Bummed with these logistic complexities, Medico Beauty also decided to outsource their logistic operations to a 3PL logistic company called Flight Logistics. The main idea behind outsourcing the logistic operations was to increase revenue, improve fulfillment capability, and save resources for core business services. Flight Logistics took care of every logistic aspect for Medico beauty, right from sourcing the products from their product partners to print, pack and delivering the order to the end customers. However, they were still missing on the necessary connectivity that allows a seamless automated data exchange between their Shopify store & third-party logistic company. Due to which they were facing a significant inefficiency in handling their daily operations. “We faced a significant inefficiency while handling our day to day business transaction, as there was no alignment & connectivity between our Shopify store & the third party logistics provider. We were bearing high operating costs and weren’t able to deliver the orders in time. That’s when Andy Millard approached Orderhive. Andy is a core member of the Medico Beauty team and apart from handling the daily business routines, he is also involved in imparting education on daily routine practices & medical products that impact the skin’s health. Orderhive filter and export all the sales orders imported from the Shopify store and send them automatically to their third party logistic company Flight Logistics for order fulfillment. 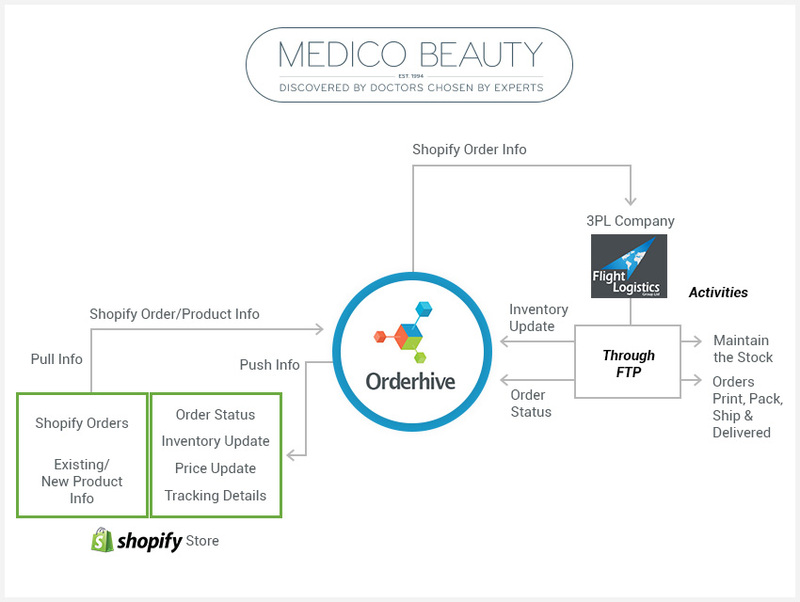 Orderhive synced Flight Logistics with Medico Beauty’s Shopify store via FTP integration. The entire process between receiving the order to fulfillment was automated by Orderhive, allowing them to have a real-time data exchange. We switched from using Order Harmony because the support was non-existent. The support we’ve had with Orderhive from Day 1 has been outstanding and they have continued to support us through the setup process. The app integrates with many of our existing software tools so makes the ordering process a lot more smoother. Want to streamline your backend process just like Medico Beauty did? Start your 15-day free trial here.